It can sometimes seem as though mass shootings are occurring more frequently. Researchers who have been studying such crimes for decades say they aren't, but they have been getting deadlier. But Americans wanting to know why deadlier mass shootings are happening will get few answers. Is it is the wide availability of firearms? Is it the much-maligned "assault weapon'' with its military style? Is it a failing mental health system? "We're kind of grabbing at straws at this point in terms of trying to understand why the severity of these incidents has increased,'' said Grant Duwe, a criminologist who has been studying mass killings since the 1990s. While mass shootings happen with regularity, they still remain so rare that there isn't enough information to draw conclusions with any certainty. FILE - A little-known device called a "bump stock" is attached to a semi-automatic rifle at the Gun Vault store and shooting range, in South Jordan, Utah, Oct. 4, 2017. The device was used by Las Vegas shooter Stephen Paddock. The profile of mass shooters — loners, depressed individuals, people who rarely smile or those who take to the internet to rant about a perceived insult or gripe — is so broad and common that it's impossible to pinpoint who might turn that anger into violence. "There are lots of people who are isolated, don't have lots of friends, who don't smile and write ugly things on the internet and blame others for their misfortunes and don't want to live anymore and talk about mass killers and maybe even admire them,'' said Northeastern University professor James Alan Fox, who began studying mass shootings in the 1980s and has written six books on the topic. In the years since, the nation has witnessed even deadlier attacks: the Pulse nightclub shooting in Orlando in 2016 in which a gunman killed 49 people and this year's shooting in Las Vegas, where a man in a casino hotel fired on concertgoers on the ground below, killing more than 55. This year's shooting in Sutherland Springs, Texas, by an Air Force veteran who shot up a church sanctuary, killing more than two dozen, also is now among the 10 deadliest mass shootings in modern U.S. history. 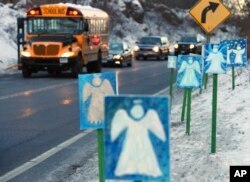 FILE - In this Jan. 3, 2013, file photo, a bus traveling from Newtown, Conn., to Monroe stops near 26 angel signs posted along the roadside in Monroe, Conn., on the first day of classes for Sandy Hook Elementary School students. It's also unclear whether the higher death tolls are the result of more firearms being available or firearms being more effective. Stephen Paddock, the Las Vegas shooter, used bump stocks to allow a number of his guns to mimic fully automatic weapons, but his perch high above the outdoor concert also made the shooting more effective and deadly. That's the tactic the gunman in the 1966 University of Texas at Austin shooting used when he took to a tower overlooking the campus, shooting down for more than 90 minutes. In half of the deadliest mass shootings, the perpetrator used at least one AR-style firearm. In one, the massacre at a McDonald's in San Ysidro, California, in 1984, the shooter used an Uzi submachine gun. The others were carried out with handguns, the weapon used in the majority of mass shootings. A woman cries while hiding inside the Sands Corporation plane hangar after a mass shooting in which dozens were killed at the Route 91 Harvest country festival on Oct. 1, 2017, in Las Vegas. The reason why someone carries out a mass shooting has been elusive, and it's a question she hopes the research will help answer. Are mass shooters of today and future bent on outdoing previous slayings by inflicting higher death tolls? That, too, is unclear. She cautions that such questions and answers continually evolve.